Baseball discipline is weak, and it makes complete sense. From one game suspensions for returning to the field after ejection to fines for participating in a fight, it's no secret that behaving badly in professional sports comes with a side of punishment—it's just not usually a severe one. Bad behavior is good for the game. Major League Baseball—and to a similar extent fellow pro leagues NBA, NFL, and NHL—have a precarious duality on their hands when it comes to discipline, and MLB's disciplinarians—Chief Baseball Officer Joe Torre and Senior VP of Standards and On-Field Operations Joe Garagiola Jr.—must walk a unique tightrope each time a player, coach, or manager does something worthy of supplemental discipline. To preview the conflict, on the one hand is morality, virtue, and what essentially amounts to the rule of law and order. On the other, however, are better ratings, more fan involvement, compelling storylines, and, ultimately, more opportunities to market and generate revenue. In baseball, specifically, ejections and fights are theatre: the crowd usually cheers and boos vociferously, and fans can't wait to see what's next. We watch ejection videos ad nauseam, and submit obscenely high-priced bids for mere articles of clothing that played a supporting role during the latest episode of "Manager Meltdown." Sometimes we get an actual fight or brawl, and the video views really take off: For every fight that produces over 1 million views, I'll show you a 300th strikeout that's still stuck in the thousands. ...Followed by anything involving Joe West. In fact, of the Top 28 videos on MLB's Youtube account, 11 concern ejections, fights, bench clearings, or other similar instances of bad behavior—not strikeouts, grand slams, or World Series wins. 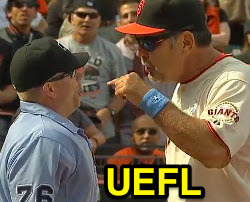 On this website, fights are generally the most popular ejection reports (followed by anything involving Joe West), and the greater the controversy, the higher the viewership and comment count. The nightly national news probably won't cover a simple game. But it will cover a huge bench-clearing brawl (this Canada-Mexico brouhaha was ABC national news' sole coverage from the 2013 World Baseball Classic). 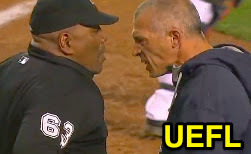 Yet at the root of a majority of baseball ejections is a distinct disrespect of the umpires, those uniformed personnel charged with officiating the game, upholding its rules so as to make the game fair for all, and, according to the rulebook, serving as the only official representatives of baseball on the playing field during a game. Clearly, to disrespect the umpire is, to a logical extent, a disdain for the Commissioner's office and the sport itself, and must be addressed: After all, to intimidate the umpire or otherwise campaign for calls is to take the official's 50-50 sense of impartiality and turn the tide in one's favor to 51-49, or some similar edge. Doing so clearly bends the rules of the game and makes the game unfair, if by only a fraction of a percent. Such intimidation tactics must clearly and immediately be denounced. wear very specific logos to reflect that fact. 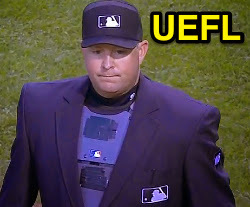 An umpire derives his/her authority from a league office, assignor, conference, UIC, etc., who entrusts said official with carrying out the umpire's duties on game day. 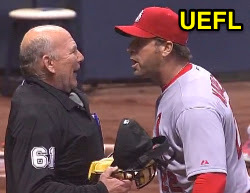 Thus, the umpire's decision to dismiss a disrespectful player/coach who has violated the game's rules, logically, must be supported by the office/assignor/conference/UIC, lest the umpire's (and any other umpire's) jurisdiction be diminished and his/her ability to officiate compromised. Yet Bryce Harper was suspended for just one game (he dropped his appeal during the second game of a doubleheader, a game he may well have sat out regardless of the discipline) after returning to the field following an earlier ejection and yelling profanity at the ejecting umpire; Gibbons did a similar thing last season...and also this season. How to get the crowd into the game? Have a meaningless "baseball fight." And speaking of that Blue Jays-Rangers fight, the sole player (Odor) to throw and land a punch received an eight-game suspension, a pitcher who intentionally threw at a batter (Chavez) and Manager returning to the field after an earlier ejection to fight (Gibbons, who is a return-after-ejection repeat offender) received three games, with other fight participants receiving just a game or just (nominal, albeit "undisclosed") monetary fines. It's on par with past violent brawls. When Carlos Quentin charged Zack Greinke and broke the pitcher's collarbone, Quentin too received eight games. 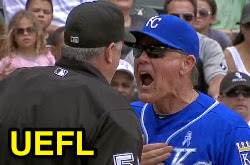 KC fans live through Ned Yost for this ejection. 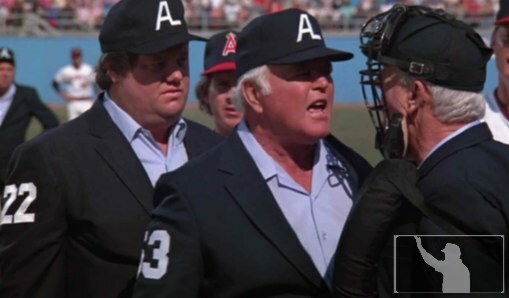 The reason baseball discipline for run-of-the-mill or "ordinary" player/coach/manager ejections—where the ejectee is ejected for disrespecting the umpire (and, by extension, the game itself)—is fairly weak, lenient, or low-key is that, from a marketing standpoint, ejections are extraordinarily good for the game. Ejections drive viewership, generate "buzz" and interest, and #makebaseballfunagain. Getting into the mind of the average fan, if the player disagrees with the umpire's call, chances are the fan does, too. And if the player gets heated about it, chances are the fan is heated, too. Hence, the fan lives that anger (or "passion") vicariously through the player or coach who gets chucked on their behalf, and derive pleasure from their anger being validated in such a way, which further bonds the fan to the game of baseball and posits them to spend more time and money on the game in the future. In other words, ejections help the business of baseball make more money. Yes, something has to be done to preserve order, but not so much as to compromise the business. Bochy speaks for all of SF as he berates Much. Thus, baseball tacitly encourages ejection-able behavior through its weak penalties because, as a business—as the American pastime hoping to retain relevance in the new era—it must. Bad behavior has been an exorbitantly wonderful business model for baseball...but there is a limit. Remember Odor getting eight games for throwing and landing a punch? If Odor were to have injured Bautista—or himself—the game would stand to lose a certain amount of business and popularity. Some order must be maintained, and that order appears to be the (relative) health—insomuch is practical for business purposes—of its participants, and namely its player participants. 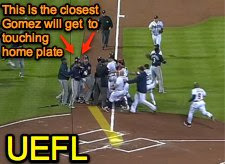 That's why the home plate collision rule (Posey Rule) exists and why the bona fide slide rule (Tejada Rule) exists. And it is also why pitcher suspensions for intentionally throwing at batters are similarly more severe than ordinary ejection penalties. Baseball loves its bench clearing brawls—just as long as it stays a "baseball fight" where everyone stands around and ultimately does nothing of consequence. Crossing over into hockey territory is too much of a good thing. 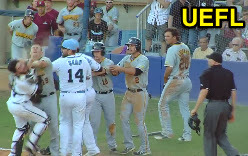 Ejections, fights: it all trickles down eventually. Lest we forget: It's all competitive entertainment. Perhaps this is a discussion for another day, but what is clear is that big league ball—baseball, basketball, football, and hockey—is a conglomerate of entertainment. It's why actual entertainment companies own professional sport franchises (the Anschutz Entertainment Group [AEG] has dabbled in half of the Los Angeles market, including current holdings in Lakers, Kings and Galaxy), and financial investment groups pick up the leftovers (sticking with Los Angeles, it's Guggenheim Partners that owns the Dodgers; the group also owns the LA Sparks). It's why the company class is "sports and entertainment." 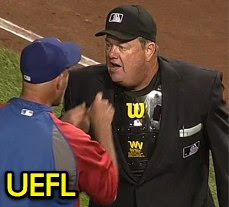 In all, ejections survived the onset of instant replay, and will continue to persevere through any computerized strike zone or mandatory slide rule: as long as no discernible physical harm befalls its participants, big league baseball will continue to dole out weak discipline for ejections and manager theatrics. After all, it's just good business.